At 7:30 A.M. on January 22, 1943, the temperature in Spearfish, South Dakota was -4ºF. A mere two minutes later, the temperature had suddenly jumped to +45ºF, a swing of nearly 50 degrees in a manner of two minutes. The Great Plains is known to be a region with extremely volatile weather. However, with respect to volatility on this short of a time scale, this one event is still in the record books. 75 years later, locals, as well as those interested in weather, still talk about the event. In fact, the event is mentioned in the Wikipedia entry on Spearfish. But, why so much volatility? Why here? The answer to that question lays in the geography of the region. 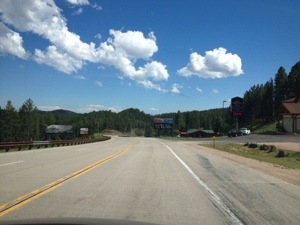 Spearfish sits just north of the region known as the Black Hills. 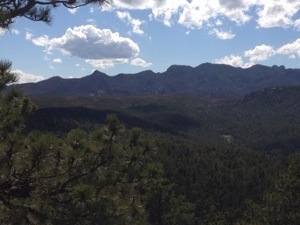 The Black Hills, although detached from the Rocky Mountains, are actually quite mountainous, with peaks rising several thousand feet above the river valleys. 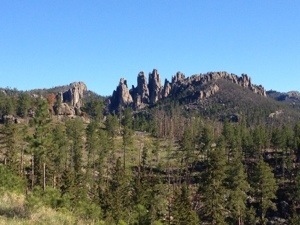 The manner in which peaks rise up in either direction while rock formations are carved out by small creeks is quite reminiscent of the Rockies. Just over the border, in Northeastern Wyoming, Buttes of varying colors pop out of the more open, but still hilly landscape. Only ten miles south of Spearfish is one of what feels like 500 different waterfalls that goes by the name “Bridal Veil Falls“. Okay, maybe it was not exactly like that, but it does seem pecular. As far as Spearfish is concerned, traveling in the other direction, North, from town, could not be a more opposite experience. 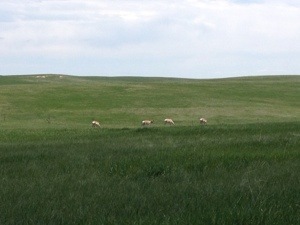 It is the Great Plains, and specifically the Dakotas, the way most people picture it. It is this contrast, and specifically the North-South orientation of this contrast, in Spearfish that created this record breaking temperature change. When air travels from high elevation to low elevation, it warms. It is this exact reason that Denver, Colorado, just east of the Rocky Mountains, has frequent warm spells in the middle of the winter. In fact, January 16th is the only calendar date in which Denver’s record high is lower than 65ºF (it’s 64). With the flat, wide-open, treeless land to the North, it could not be easier for bitter cold air straight from the North Pole to reach Spearfish. However, when warmer air does come from the South, it is further warmed by its trip over the Black Hills. But, why all the fuss about setting records? Specifically, why do people care so much about bizarre records? In 1943, the news about the wild temperature swings in Spearfish provided a war-weary American public with some lighter news. And while the impact was only a bunch of broken windows, people can learn from these records. 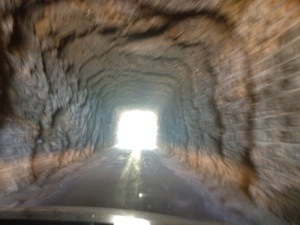 The wild temperature ride in Spearfish demonstrates how the atmosphere works. Is there something similar to be learned by the man who broke 46 toilet seats with his head in one minute? Do people who have watched that video avoid breaking their own toilet seat at home? Or, is there something other than intellectual curiosity at work? Records like this one are interesting to people regardless of whether or not they care about the ins-and-outs of how the atmosphere works. They are just entertaining. They also provide people with one of the main things we are all searching for in the modern world; significance. The people of Spearfish can always bring up this wild temperature swing as something that makes their town stand out among all of the towns of roughly 10,000 people out there. It is the same for the man who bloodied his head breaking toilet seats, or that one person in everyone’s social circle that did something bizarre, like stop at every Arby’s between Chicago and Saint Louis (there are 13). They have this way of making the world just a bit more interesting. 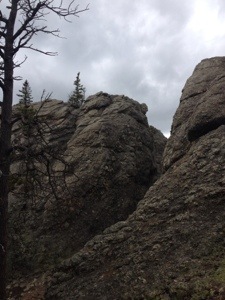 This entry was posted in geography, South Dakota, Unique Rock Formations, Waterfalls, weather, Wyoming and tagged Black Hills, records, South Dakota, travel, weather extremes on August 10, 2018 by Stephen Jaye. Mount Harney is the tallest peak in South Dakota. In fact, it is the tallest peak anywhere east of the Rocky Mountains. The guy at the Custer State Park visitors center actually said it was the “Tallest peak between the Rockies and the Alps”. While that is technically true, it is a bit of a stretch. At 7242 ft., it is taller than anything in Appalachia, including the tallest peaks in the Smoky Mountains, but not really by too much. The difference is less than 1000 ft., and is probably made up for by the fact that the bases of those mountains are at lower levels. However, it was still a really good hike. In fact, it kind of reminded me of hiking near Boulder a bit. It is at similar elevations, a similar total climb, and there are some major rock formations here too. Our loop from Sylvan Lake up to Harney Peak and around by two other major features; Little Devil’s Tower, and the Cathedral Spires, took us a bit over 8 miles today. With what is probably close to 2000 ft. of vertical climbing, between the main climb and a couple of side climbs, it was a very satisfying hike. 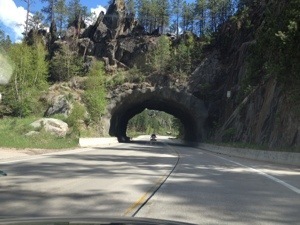 With this morning’s drive taking us by the ” Needles Eye”, we have actually seen nearly half of the unique natural features of South Dakota. Not bad considering that we only arrived in South Dakota on Sunday. 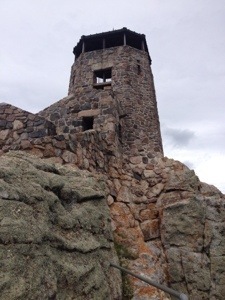 At the top of Harney Peak there was a strange lookout point. It was actually the remnants of an old building. We think people actually hid out here, but I am not sure who. It was still interesting to see the place, and imagine the life of someone living on top of the tallest peak in the area. From this vantage point, you can see all of the peaks. We could look out on all of the peaks of the Black Hills, including the ones we had driven up and down yesterday and today, and they all showed up significantly below us. This may be the first time I have experienced this exact feeling, climbing my own way up to the top of the highest peak in the area. In 2005, I biked up Blue Mounds (Wisconsin), but the terrain there is nothing compared to what it is here. In 1998, my family and I drove up Pike’s Peak, but, we drove. 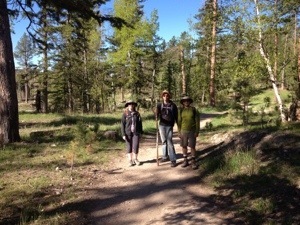 The alternate trail we took on the return trip to the car took us real close to the Cathedral Spires. These rock formations remind me of the Dolomites in Northern Italy, with their mostly vertical, but imperfect, gray colored rock structures of varying heights. In fact, for the entirety of the hike, as well as in many cases before and after, I have been referring to this feature as “The Dolomites”. And, no, I am not trying to show off that I am Italian, or that I have been to Italy. It is just kind of natural for people to make the association in their head based on the visual. I am reminded of an instance when someone I knew kept referring to the green sauce that they provide with samosa at an Indian restaurant as guacamole. He was not trying to show off his Mexican-ness, it was just that his previous experiences with green sauces in restaurants had mainly been guacamole, and the natural association was made. In the same vein, the other time. I had seen rock formations like that, it was the Dolomites. Some of the other rock formations did look like the Flatirons in Boulder, with a major exception being that they are lighter in color. On this hike, in several places, both on and off the trails we were traversing, we passed through some tight areas inside rock formations. This was a good deal of fun, although somewhat scary. Oddly enough, I enjoy doing things like this, and I have not even completely figured out why. I guess there is a slight element of danger in it, and it does provide the hike with some variety. But, hiking is already an interesting enough activity that it does not need variety. And, I am not really pushing my limits anymore with this nonsense, as I have done it plenty of times over the past several years. Maybe it is just curiosity, the entrance into the unknown, the feeling you get when anything can happen. In this sense, it would be the same feeling that drives people to take a new route home, enter into new activities and new social circles, or even drink or do drugs. The flirtation with the unknown seems to come out in me a lot; skiing, hiking, parties, etc. One final note about the hike. 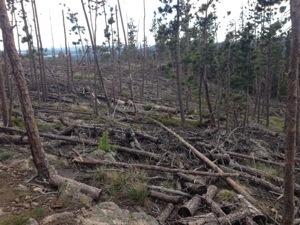 Boy have these pine beetles done a number on the forrest here. 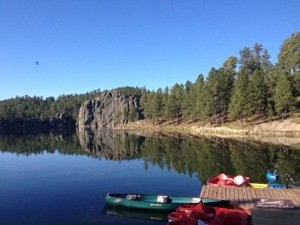 Scenes like this one are seen everywhere, and when viewed at a distance, parts of the “Black Hills” look quite red! I knew this was a big problem in Colorado, but it actually seems like the beetles have done even worse to the forests here. It is sad to think that the very nature of these places are bound to change forever, but in life, change is inevitable. It cannot be avoided at any costs. 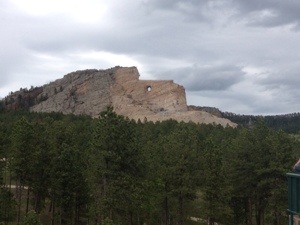 Our other activity today was visiting Crazy Horse. Crazy Horse is a statue of a famous Native American hero that sits on the other side of the black hills from Mount Rushmore. But, it is incomplete. It has actually been under construction since 1948, and is still nowhere near close to done. According to the hosts at our campground last night, the Crazy Horse statue will “not be completed in your grandchildren’s lifetime”. This slow progress is due to the desire to make this statue quite enormous, as well as their commitment to use only private funds. Turning down money shows a significant amount of pride, and/ or adherence to principles. Maybe both, they are actually probably quite related. 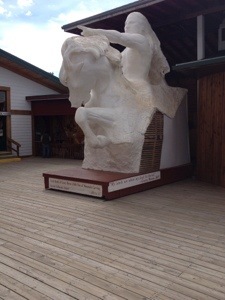 At Crazy Horse is also a museum of the Native American. We did not intend to spend all day there, so I pick a few excerpts to read, some about famous Native Americans. I don’t even remember the stories themselves, but reading these stories makes me more curious about Native American culture in general. History is written by the winners, and in the battle for North America, we, the white man, are the winners. But, it is hard to ignore the fact that we kept making and then Subsequently breaking treaty after treaty with these Native tribes. I would love to know the full story behind this, from both perspectives, and how the modern day Native Americans feel about all this, as well as the situation they are in now. Are they happy to have all the modern conveniences associated with the U.S.A.? Do they feel that we are the ones protecting the freedom of all? Or do they feel they cannot live the lifestyle of their choosing, and their continent has been usurped? I bet you get some real mixed emotions. On the campground tonight, we got a bit goofy. In fact, we spent probably about half an hour, sometime around sunset, trying to throw pine cones into the campfire from various places. Most of them were from the top of a rock. It was some unexpected (and free) fun. I think our society could use a bit more of that if you ask me. One of my favorite things about trips like this are actually simple things like this that bring joy out of nowhere, unexpectedly. 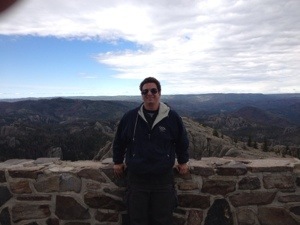 This entry was posted in Camping, hiking, Historical Locations, South Dakota, Uncategorized and tagged Black Hills, Crazy Horse, Custer State Park, Harney Peak, Hiking, South Dakota on June 5, 2013 by Stephen Jaye. 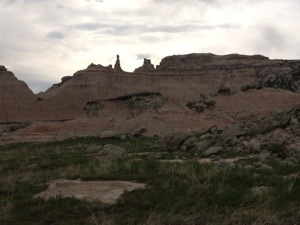 Today’s first activity was a hike at Badlands National Park. Yesterday evening, at the visitors center, I had chosen a hike for our group that was mostly considered “moderate”. Only the initial 1/4 of a mile, which started from the parking lot and took us up the side of the structures towards a plateau was considered “strenuous”. This initial part was pretty strenuous, and, had it gone on for over a mile, would have made a difficult hike. But, after the initial climb, most of the trail system we traversed on this morning, would be pretty flat, with only minor inclines and declines. This, of course, was the part of the trail that was labelled “moderate” in difficulty. I guess, the “moderate” difficulty rating was a let down because, the badlands, while a beautiful natural place, is not a place with a lot of terrain. There simply isn’t 1,000 ft. worth of incline to find. Difficulty ratings for hikes have no set standard. How any place labels it’s hikes is completely to the discretion of the park. It reminds me of the differences we observe between ski trails labeled green vs. blue vs. black at different ski resorts. Some of the easiest black diamond ski trails I have skied in Wisconsin may even be considered green if they were to be in Colorado; certainly, they would at least be blue, not black. So, I guess it is important to understand the relative context of activities while planning them. While occasionally you will run into an activity with a standardization of sorts, like whitewater rafting, it seems like when it comes to most activities, descriptions of difficulty levels are subjective as well as relative. The biggest waste of time today was driving about five miles out of our way to search for Bison at the Badlands. 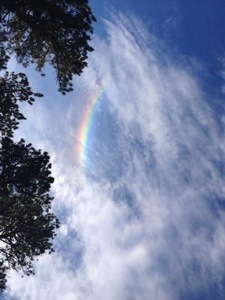 The reason being that our ultimate destination today was Custer. 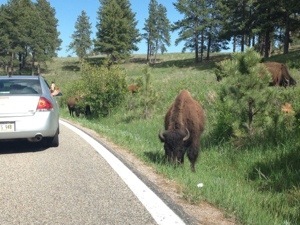 In Custer we saw so many Bison, and so many up close, that the search for Bison anywhere else today, well, the idea of looking for Bison anywhere else today seems utterly silly at this point in time. 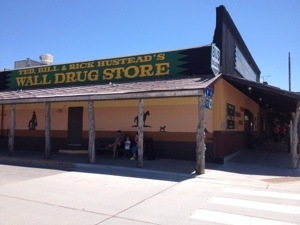 We gave in to the nearly 200 (well, possibly even more) billboards we saw yesterday, and we went to Wall Drug. This place does a really good job of marketing itself, given that the main goal of marketing is to make people aware of your product. 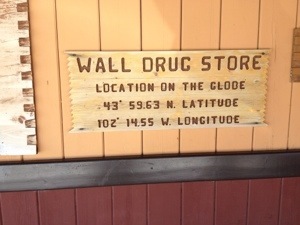 The signs, bumper stickers, and such make sure everyone is aware of the existence of Wall Drug. I had heard from others that the place was a gigantic tourist trap and not really worth it, but it is so close that it is worth going and finding out for myself. The place was actually alright. It was a little bit cheesy. In the front , there is an actual drug store, true to its name. Behind that is a restaurant and ice cream parlor, which is pretty neat. The rest is mainly souvenir shops. Behind the store, there is this kind of old west town that many tourist traps in the high plains have. The only oddity is that they also have a really poor replica of a dinosaur there too. This was advertised on many billboards, so I am glad the delivered on this. But this does not belong right next to a replica of a village from 1880. Time periods should be consistent. I made one key mistake there. I ate both ice cream and a donut. That is just simply too much sugar, simple sugar. A little over half an hour down the road, I got that sugar crash, and, for about half an hour could barely keep myself awake. This sucked, because the scenery was starting to become really interesting as we approached Rapid City and then drove Southwest on U.S. 16, and the 16-A. The mountains here (I guess they are referred to as hills), are legit. 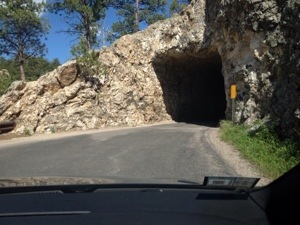 I mean, the way the look, both from a distance, and up close when you drive into them, are actually not too different from the mountains of Colorado. This, I find somewhat surprising. When people make lists of states with really cool mountains, and I mean really big ones, it does not seem like South Dakota is ever really on that list. At least the association is never really made in my mind. I had always kind of known South Dakota to be kind of more interesting than the other plains states, and known that this area existed. But, it was not until now that I fully realized that the terrain in this area is significant when compared to other places in the country. It’s not as mountainous as Colorado, but it is not insignificant. Today the sun rose at 5:30, and set at 8:30, for a total of 15 hours of daylight. I kept thinking about how much is possible with all these hours of daylight. It takes generally an hour or so to set up camp, start a fire, and cook. Today, we were able to take showers because we had extra time after cooking. This was after not arriving until nearly 6:00. In most other months, this would not have been possible. All this week, it seems like we had been less stressed, or had gotten more done than we would have in the fall, or some other time of year with less sunlight. The problem is, June is the best time of year for a lot of things. Storm chasing is good, rafting is good, and with the most daylight possible, camping, touring, and such are all easier. So, how do we take advantage of our Junes. Should we work our asses off at other times of the year so we could get June off? That might cause too much stress at the other end of the year. How do we decide what activities are most deserving of these days? At the very least, the NBA and NHL can stop extending their playoffs into June so people don’t use up this time watching sports. Oh, and we also saw Mount Rushmore. It was a bit smaller than I expected. This entry was posted in hiking, National Parks, South Dakota, wildlife and tagged Badlands, Black Hills, Hiking, South Dakota on June 5, 2013 by Stephen Jaye.